Two massive rainstorms made Springfield a virtual island on Sept. 8, 1926, flooding streets and basements, stranding autos, trains and streetcars, and leading to the electrocution of an Illinois Watch Co. worker. Even people using the Knights of Columbus swimming pool fled the building in fear of drowning. The Sept. 8 downpours, however, were only the worst of a massive, persistent pattern in early fall 1926. Storms began pummeling central Illinois in late August that year, and they didn’t let up until early October. One cloudburst dumped 3.71 inches of water on the city Sept. 3 – which, like the Sept. 8 deluges, still holds the record for that date – and the rain kept falling, day after day. Precipitation for the whole month came to 15.16 inches, making September 1926 the wettest month ever in Springfield – by nearly 2 inches. A total of almost 20 inches of rain pummeled the area between Aug. 29 and Oct. 3. The soggy weather all but destroyed farmers’ crops, especially grains like oats and barley. In turn, that led many area farmers to buy combines, previously uncommon in central Illinois, in time for the 1927 harvest. 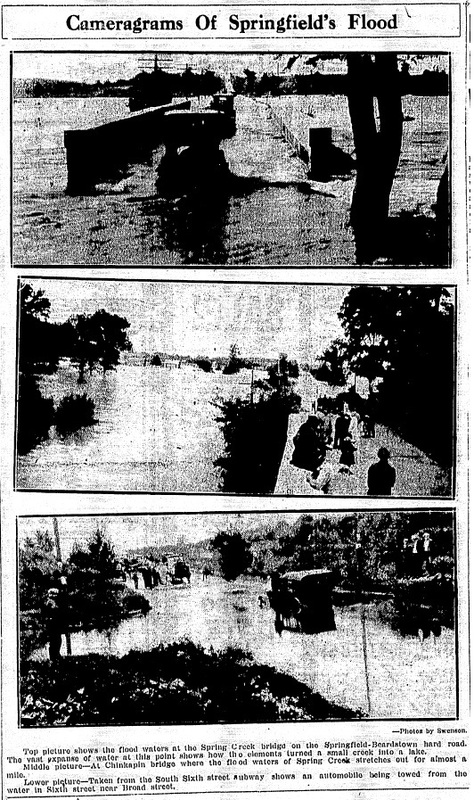 The Illinois State Journal reported on the twin deluges the next day. Water ran in veritable rivers over sidewalks. In many cases it rushed in doors and windows of buildings to leave them impromptu swimming pools. At the Knights of Columbus building, Sixth and Edwards streets, employees and members in the bowling alleys and swimming pool (both were in the basement – ed.) were forced to flee to higher floors, so savage was the onrushing water. It crashed through the doors of the first floor, completely covering it and compelling swimmers and bowlers to rush to safety. Watchmaker Fred Josseck was moving jars of fruit in his flooded basement on Converse Avenue when a short-circuit knocked out power to the basement lights. Josseck shouted to his wife upstairs to turn off the house power, but it took her a few moments. Meanwhile, standing in two feet of water, Josseck tried to check a light socket. The socket still had power, and he died instantly. Some of the worst flooding took place in the 300 block of South Fourth Street and along South Grand Avenue and Grand Boulevard (now MacArthur Boulevard) near Washington Park. Most roads going in and out of town were cut off at one or more places. Peoria and Chinkapin roads were flooded, meaning motorists had to take a nine-mile detour to go north. To the south, four feet of water flooded an underpass on the Sixth Street road. Eastbound, the Decatur hard road was flooded for more than a mile. Some motorists were able to drive through the water, carefully, “but slipping into the ditch was no uncommon thing,” the Journal said. On the west, Bradfordton Road was under 10 inches of water, and an overflowing Spring Creek blocked access to the Beardstown Road for hours. Notwithstanding the record-breaking storm, the Journal reported that the show indeed did go on at the Majestic Theater, a vaudeville venue in the 400 block of South Fifth Street. When the lights went off at the Majestic theatre last night, Trovato, comedy violinist, continued to play while the crowd sat in darkness and applauded. The actors were wading around in the basement, which was flooded, going to and from their dressing rooms. This entry was posted in Agriculture, Disasters, Sangamon River. Bookmark the permalink.